I've decided that every Wednesday I'm going to write about women who have made an impact on my life. These ladies are going to be women I've known personally, women I've never met, and fictional ladies. There's no shortage of strong, badass women in the world, but no one's talking about them. And, wow, do I love talking. 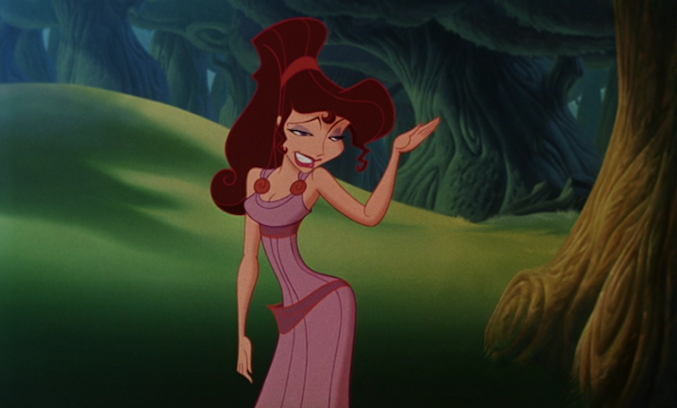 I'm going to kick things off with a really fun, fictional lady: Megara from Hercules. I know, I know. You're probably thinking, wow, did this girl really say she was going to talk about powerful women, only to start this shindig off with a fictional lady from a Disney movie who's not even a princess? To that I say, yes, I most definitely did. Hercules is the best Disney movie out there, but you don't hear much about it. I worked at Disney World for three years and I don't think even Disney cares enough about it. I mean, it's not as forgotten as The Hunchback of Notre Dame, but still. For a movie with hits like Go the Distance and (I Won't Say) I'm in Love, you'd think they'd show it a little more love. Now you know how serious I am about Hercules. Objectively, it's got everything a good movie needs: a hero, a villain, a damsel who's not in distress, a quest, and some dope songs. I like it because of the way Meg is treated. She's there and she's not to be messed with. She can hold her own, and even though she's forced to do Hades' bidding, she still manages to make her own decisions. Sometimes those decisions are terrible, like the whole selling her soul so the douchebag man she loved could go free, but it was her decision and that's the important thing. The media talks a lot about strong female characters, and 9 out of 10 times they really mean action stars and superheroes. That's great. We've had some female superheroes lately. There's Charlize Theron in Mad Max: Fury Road, Melissa Benoist as Supergirl season 1 (we'll talk about the mess that's season 2 later, don't you worry), and the upcoming Gal Gadot as Wonder Woman. They're all great examples of Hollywood trying to make up for years of manic pixie dream girls. I'm not knocking these representations, because I feel like such a child when I see these ladies. I feel amped and like I, too, could be a dope superhero and save the world. Do straight white dudes feel this way when they watch action movies, or are they just desensitized at this point? Here's the important thing; a woman does not have to be physically strong to be a strong female character. Strong, to me, is all about the quality of the character. Does she have agency? Is her voice heard? Is she fully formed? She doesn't have to be nice or right all the time. She can be girly or outdoorsy or into science or an athlete or rich or poor or sad or exuberant. She can be flawed and make bad choices because she's human! Men have been making terrible choices for thousands of years, and it's about damn time women can make some, too. So, yeah, I think Meg is a strong female character. She is who she is, painfully so. She's strong-willed and romantic. She risks her life to help the one she loves (spoiler, I know, but how have you not seen the movie yet?). Meg is funny and also deeply sad, but that doesn't detract from her femininity. She's the sum of her parts and allowed to be many different things. That's called being a woman. There’s no one right way to be a woman, that much is for sure. I think it's nice for young girls to see someone who's not mild-mannered or willing to change who she is to make someone else happy. I'm glad little five-year-old Tina learned that real strength is knowing who you are and following your heart. In the end, "a true hero isn’t measured by the size of his strength, but by the strength of his heart."